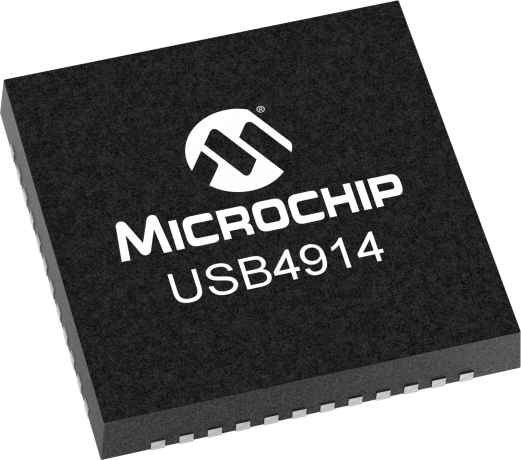 The Microchip USB4914 is a USB2.0 Hi-Speed Hub with unique Smart Hub features targeted to automotive consumer ports and head unit applications. The USB4914 is compliant with the USB 2.0 Specification and has passed AEC-Q100 testing. This highly integrated chip optimizes board area and reduces overall system costs, with the incorporation of leadership functionality, including; Multi-Host Endpoint Reflector, battery charging support for industry profiles, embedded 32 bit micro-controller for the implementation of USB IO bridging and USB Power Delivery. The multiple downstream USB ports support USB2.0 Low Speed/Full Speed/Hi-Speed with a single USB2.0 Hi-Speed upstream port for host connection. The Multi-Host Endpoint Reflector employs patented technology such that USB data is 'mirrored" between two USB hosts (Multi-Host) in order to execute USB transactions. This capability is fundamental in delivering architectures for smart phones that require host / device swapping in order to set-up an automotive session, including graphic user interface, from the mobile device to the head unit display. Standard USB drivers, which are native to the operating system, including the CDC/NCM class driver, are utilized to execute device operation. No custom drivers are required. The Multi-Host Endpoint Reflector is considered a USB controller that is integrated in conjunction with a USB 2.0 Hi-Speed hub and USB2.0 dual role function physical interfaces.